learn about WPC flooring and why it might be the right floor for your home. Why do you need WPC? New technology is generating huge advances in the flooring industry with the creation and improvements that have been made in flooring material. WPC flooring, or wood polymer composite flooring, is taking the industry by storm and for good reason. WPC is one of the only floors that can call itself truly water proof thanks to its core composition. This makes it ideal for homes or offices that have heavy traffic and see frequent accidents. Whether it is a puppy accident or spilled coffee from a rough Monday morning, WPC offers outstanding protection. Your next question may be, why should I choose WPC flooring? Let's compare WPC to laminate flooring to take the guess work out. 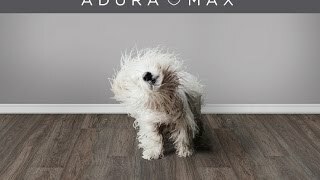 Mannington introduces Adura Max, the ultimate waterproof, noiseproof and oops-proof floor. Let you family put it to the test! The style you want and the performance you need–for beautiful, durable floors, check out Floorte Pro. Trust the brand you choose to put in your home. If you have more questions about WPC flooring or would like to talk to a flooring expert about WPC in you home, fill out a contact form!